Kuwait, 7 February 2019: Al Hamra Real Estate Co. in partnership with COFE App recently concluded its first three-day Coffee festival, which took place in Al Hamra Luxury Center. Al Hamra COFE Festival included an action packed itinerary of competitions and special promotions. The festival was held under the strategic partnership of Kuwait Finance House which entitled their respective customers with offered exclusive promotions. The festival was a success with more than 5000 visitors to enjoy a lot of drinks from prominent coffee shops participating, namely Caribou Coffee, CAF cafe, Toby’s, McCafe, and Costa Coffee. Employees from Al Hamra’s Business Tower and mall guests visited to order through the COFE App and enjoy special deals in addition to the grand draw worth $10,000 which was won by Mrs/ Fatma Al Orayfan. Over the three day festival, Baristas from across the nation were welcomed to sign up for the Latte Art Competition which was sponsored by Earth Roastery. 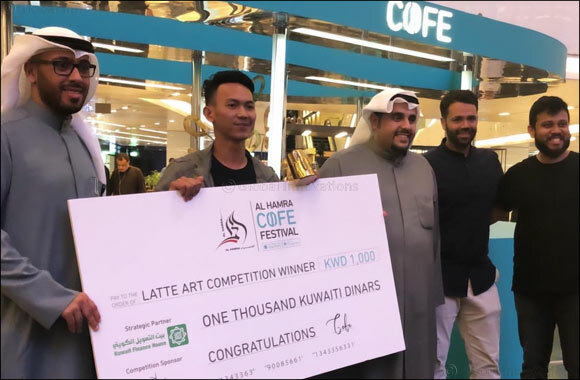 The winner, 25 year old Chairul Fadly from Indonesia, received the first ever Al Hamra COFE Award and a KD 1,000 cash prize from Al Hamra Real Estate Co.. More than 100 Baristas from Kuwait signed up for the competition, totaling 63 rounds taking place from 29th until 31st of January. Al Hamra Real Estate Co. Marketing and Public Relations Manager, Mr. Abdullah Al Mansour said: “We wanted to bring our growing community of coffee enthusiasts under one roof.